Last week I spent a while inside a hole in time. In the early hours of Saturday morning I flew to Washington DC and on Wednesday I was already back in Israel, enveloped in the warmth of my family, everyday life, work, home and activism. I traveled to DC in for the JStreet National Conference, as a representative of Women Wage Peace, to speak at a panel sponsored by the JStreet Women’s Leadership Forum. The conference this year was organized in the theme of “Defending Our Values, Fighting For Our Future” – a strongly appropriate title given the public and political climate since the election of Trump as president. 3,500 participants from all over the US, Israel and the Palestinian Authority came together to think, listen and voice ideas about how to keep moving toward a two-state solution in a time when no politician in Israel or the US persist in this. As a story teller, I was constantly looking for stories I would want to cherish and take with me. Here are 4 short stories and an epilogue. The panel I participated in, sponsored by the Women’s Leadership Forum, was titled “Change makers on the Ground in Israel”. I talked about Women Wage Peace, and why I am so committed to this movement. I told the listeners that we view the Israeli-Palestinian conflict through a powerful inter-sectional gender lens. The audience, mostly women, were nodding in agreement and understanding. The attentive faces told me my words were welcome and relevant. I hoped my message would trickle and resonate outside that room and was overjoyed when my friend and collaborator Nancy Kaufman, CEO of the National Council of Jewish Women, echoed my words in a panel that took place the following day in the plenum. I did come out feeling that we still have a long way to go until women from diverse communities are equally represented in formal negotiations and in civil society efforts to end this conflict. However, in order to demand that of our elected officials, we must implement principles of inclusion and diversity in our own spaces. The gender lens is not a “prop”, it is a way to examine our political reality fully and comprehensively, without overlooking the perspectives, needs and assets brought to the table by 51% of the participants. I also talked about the significance of hope and the notion that we cannot live without hope. During the conference, speakers kept stating that “despair is not an option”, which is very true. Despair, in the sense of apathy, indifference and resignation is, indeed, not an option. But sometimes we’re moved to action by a sense of desperation and urgency, driven by the feeling that we have nothing to lose. Alongside that, there must be hope. Hope in the sense of believing in future good even when it seems despairingly remote and impossible. Hope means insistence on believing in that good even when it seems we got dealt a lousy hand this round. Hope is the stuff from which the greatest stories about the human ability rise above hardships and challenges, above the doubts and disregard are made of. Do not mistake hope. It is not a “nice feminine quality”. Hope is a radical idea that sees far and beyond. Hope, if you will, is a very serious business. 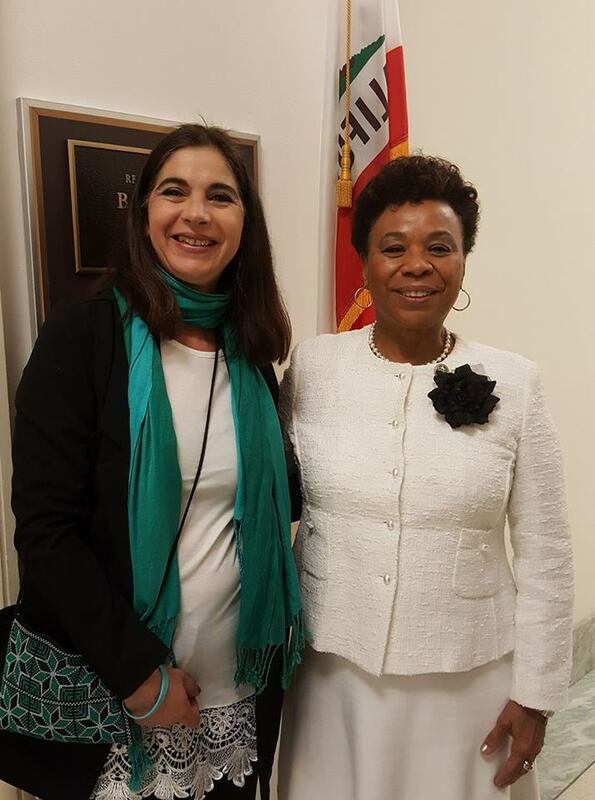 In my last day in DC I got to meet Congresswoman Barbara Lee for the 13th District of California in the Democratic Party. Lee was elected to congress for the first time in 1998 after a long and impressive career as a civil rights activist, a member of the Black Panthers and a Senator in California State Senate. I admit I was nervous before the meeting. This was my first time meeting a Congresswoman, not to mention a woman who is a model of brave leadership, determined and committed to justice and equality through and through. We had 15 minutes together. I told her about my work in the Dafna Fund and about Women Wage Peace. I spoke of the magic that was created in the Palestinian and Israeli women’s march Qasr Al Yahud, on October 19th, 2016. I told her about the tears and joy of women who had only met for the first time, falling into each other’s arms in an embrace that spoke closeness and faith in partnering for peace. As I spoke with a trembling voice, I knew she understood. All the while, I kept getting updates on current affairs in Israel: the State Comptroller’s report on the 2014 Operation Protective Edge and the winds of war stirred in order to distract public attention from the high ranking political officials’ oversights that cost us in dear life. From time to time I stole a glance at my email and IM messages from Israel. I read the Letter of the Mothers, which my friends at Women Wage Peace had written and watched as they stood firm outside the Ministry of Defense, demanding the defense cabinet to take responsibility for the Comptroller’s report and act immediately to end the conflict by resuming negotiations to reach a mutually binding peace agreement. I saw, in the pictures of my friends’ faces, the hope, determination, persistence and willingness to lay everything aside and rise again and again to act in favor of the only logical solution that will end the bloodshed, suffering and loss that is binding us in a forcible grip for too many years. Written in Jerusalem, in deep appreciation to our dear partners of the JStreet Women’s Leadership Forum.